The Jewish Federation of Northeastern New York has scholarships available to help children and college students to attend Jewish overnight camps as well as Jewish travel experiences. Because funding is limited, decisions will be based on financial need determined by completion of a detailed questionnaire. The deadline for applications is February 27, 2017, so get them in as early as possible. For questions contact Deborah Goldstein or call - 783 - 7800 ext. 230. CLICK HERE for more information. Steve Gonick ~ "While we missed our daughter tremendously, we were able to live vicariously through the wonderful communications that the Crane Lake Camp provides. The camp exceeded our already high expectations. The staff is wonderful. The kids are having fun in a safe environment and make life long friends. If anyone from CBE is on the fence about sending their kids to these camps, send them my way!" Rona Wilker ~ "We also feel so fortunate that Melissa is having such a rich experience at Eisner. This summer will mark her 7th year filled with lifetime friendships, learning about her religion, being a part of many social action projects, and so much FUN!!! Melissa is looking forward to experiencing Israel next summer with camp!? Since 1958, URJ Eisner Camp has embodied the transformative power of Jewish camping. Children from Union for Reform Judaism congregations across the Northeast join together each summer to experience the fun and magic of this special community. Eisner is located in the Berkshires in western Massachusetts. Our caring and committed staff members (many of whom were campers themselves) strive to enrich the campers’ experiences by helping them build lasting friendships. These relationships lay the foundation for our summer community, providing encouragement and support. Campers embrace the challenges of learning new skills in athletics, aquatics, the arts, adventure, and nature programs. They immerse themselves in a wide range of innovative Jewish educational pursuits and creative spiritual experiences. 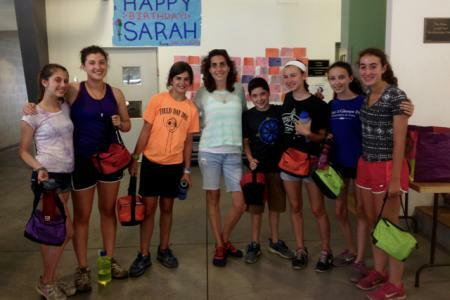 From the youngest of our day campers to the oldest of our Machon (Counselors-in-Training), every child who spends a summer at Eisner Camp returns home a little wiser, a little more self-confident, and a little more connected to the Jewish community. A summer at Eisner Camp is more than a summer of fun. A summer at Eisner Camp is meant to last a lifetime! CLICK HERE for more information. The Kutz Leadership Academy, located in Warwick, New York, is designed for teens that are looking for a challenging and exciting summer program that will enhance your skills in a specific area of interest. As a participant in this program, you have the ability to choose your classes, and create a schedule that best fits you and your needs. The recipe for Kutz is simple: Choose a Major, which you will sign up for when you are ready to register. Add in session-long Minors and daily Electives that you will choose when you get to camp. Throw in a dash of Hagshama, our leadership and life skills program that will enhance how you put your major into action. CLICK HERE for more information. At 6 Points Sci-Tech Academy, scientific inquiry meets fun! Campers entering grades 5-10 spend two weeks exploring robotics, video game design, environmental science, digital media, and a host of other fun activities in a friendly setting with boys and girls who share similar interests. Throughout their experience, campers explore what Judaism means to them—and how this complements their interests in science and technology. Our four core values shape our community – kavod (respect), kesher (connection), sakranut (curiosity), taglit (discovery), and savlanut (patience). Campers gain an understanding of their place in the long history of the Jewish people’s contributions to science and technology, and build a strong connection to Israel as an incubator of innovation. 6 Points Sci-Tech Academy is the Reform Jewish camp that curious minds have been waiting for. Located just outside of Boston’s science and technology corridor on the campus of the beautiful Governor’s Academy boarding school, 6 Points Sci-Tech Academy offers all of the advantages of a top-quality educational facility along with access to the best and brightest minds in the Jewish science and technology community. Choosing a learning track that matches their interests; Developing projects that ignite their imagination; Creating the Shabbat experience in community with other campers and staff; Learning the skills of inquiry that science and technology requires; Discovering how Jewish values align with modern science and technology. CLICK HERE for more information. Individual URJ Camps also offer Israel Camp experiences where friends create and are part of an immersive traveling Jewish community as you connect to our rich European heritage, explore ancient Jerusalem and modern Tel Aviv, the beautiful Galilee and the stunning Negev Desert. The NFTY L'Dor V'Dor program is a unique and challenging five week summer experience created especially for teens who seek a meaningful and exciting journey to Europe and Israel filled with amazing memories and friendships that will last a lifetime. Crane Lake, Eisner and 6 Points Sci-Tech Academy all provide L'Dor V'Dor programs for their campers. CLICK HERE for further information about all NFTY teen travel experiences.